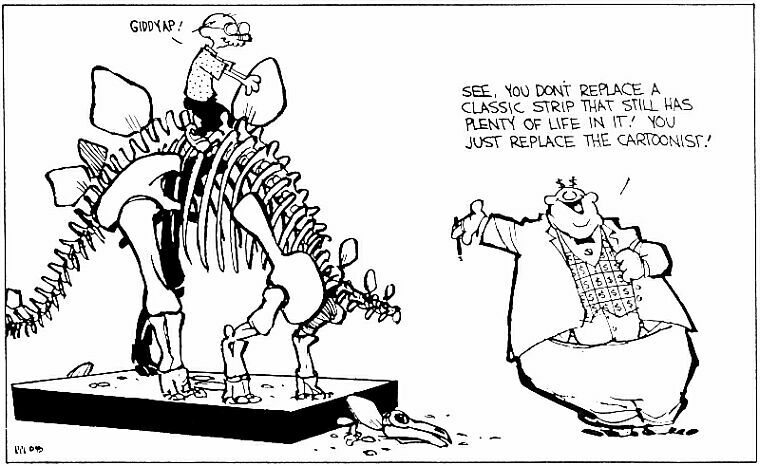 You might assume that, just because there's been so much Bloom County material on this site, I'm rather lukewarm to the usual default-chosen comic strip favorite, Calvin and Hobbes. 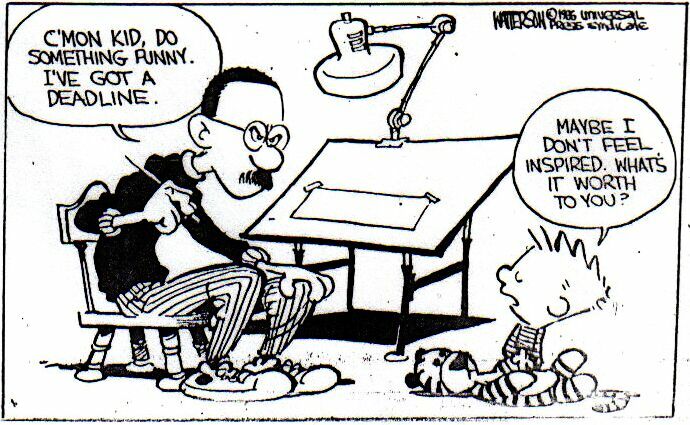 Calvin and Hobbes was always a close second. 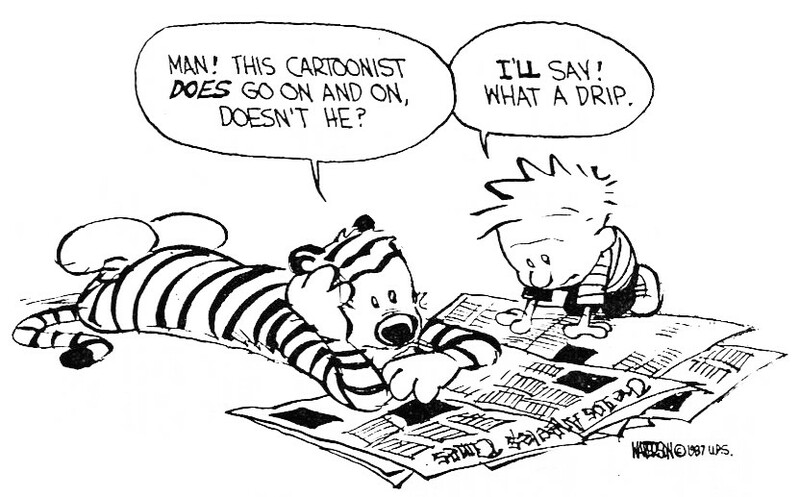 Growing up, I pretty much WAS Calvin--a loudmouth with messy blond hair and an overactive imagination. 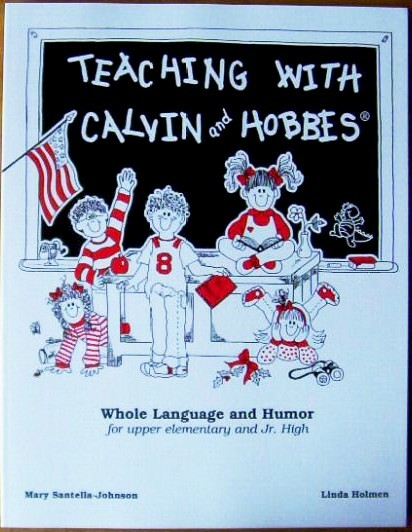 When my classroom had a "change-your-own-name day," I changed my own name to "Calvin." 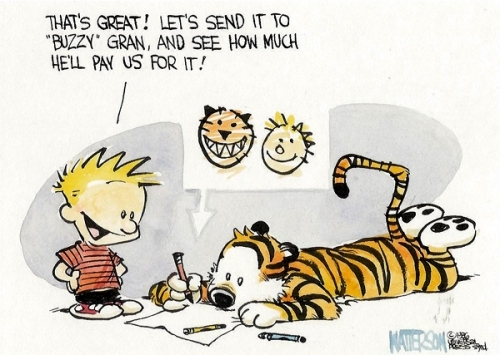 I wanted a stuffed Hobbes badly, and couldn't understand why Bill Watterson wouldn't let me have one. I had all the books and could recite every strip by heart. And I made my own book collections out of the newspaper printings because I couldn't wait for the next official ones. I colored the earlier ones rather psychedelically, ruining any value these clips might have had. The clippings came from Grandma's, and as you might guess from this evidence, there wasn't much else to do there. 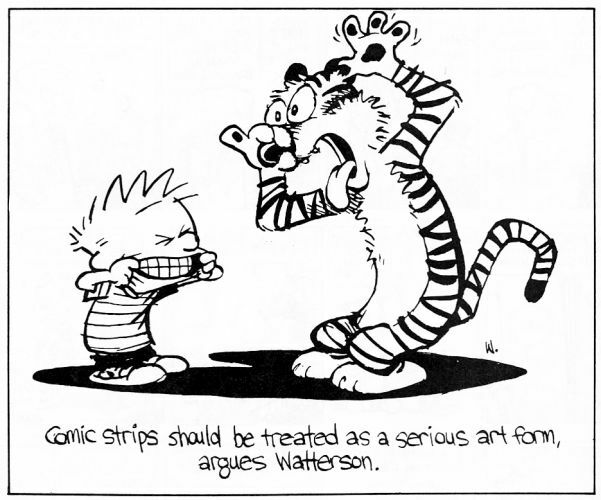 Little-known fact: the original "high slide" strip had a gradient used in this panel; the first gradient the strip ever used. In all the book prints, the area above the clouds is blacked in. WHOA! 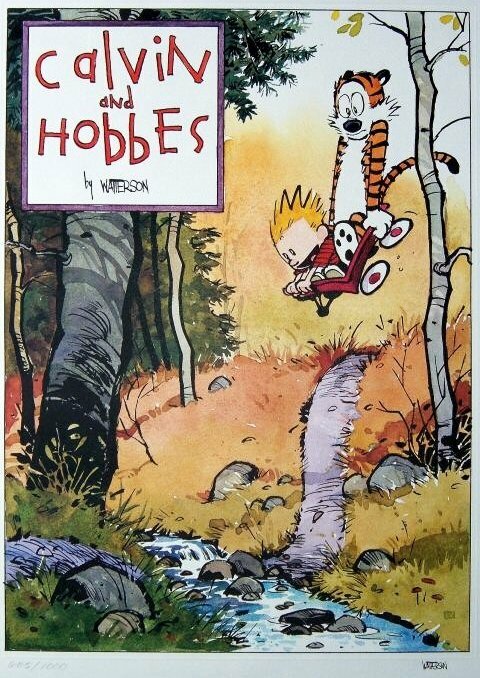 The next Watterson cover was the seventh, and it's barely recognizable as his, save for the signature at the bottom. 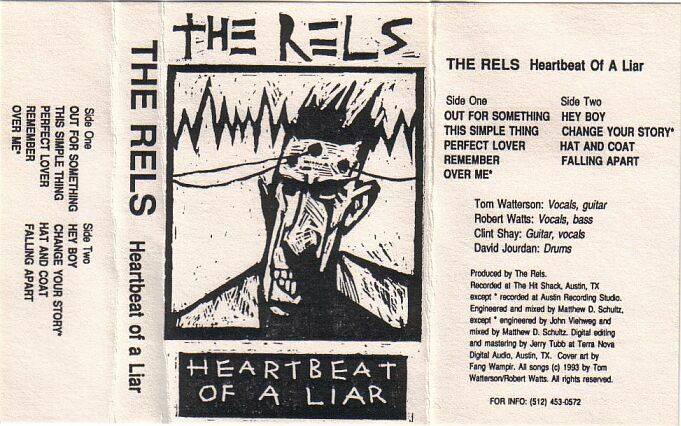 The only other time art like this appeared from Bill was on his brother's rock band albums. There, he went under the pseu-diddly-oodonym "Fang Wampir(e)," and he did a pretty good job disguising his usual giveaway style. These five postcards were, again, a freelance job from the pre-Calvin days. They appeared on an eBay auction and reader Joyce Lu alerted me to their existence. They all involve Mark Twain and are copyrighted 1983 by the "Mark Twain Journal." Any guesses where they were sold? 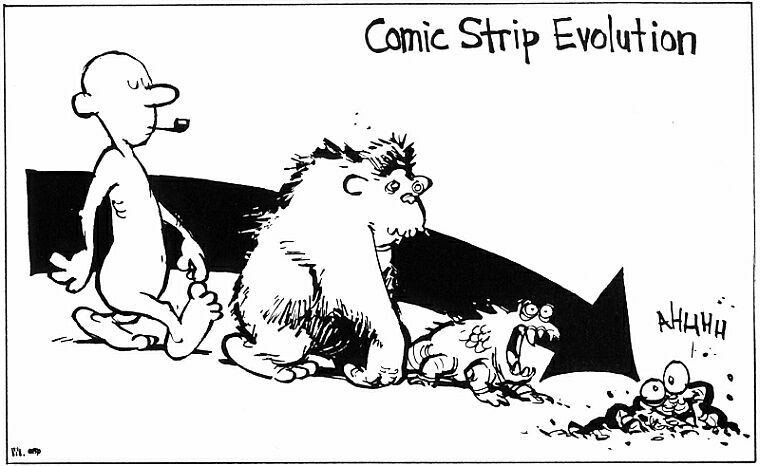 The existence of a rejected pre-Calvin strip has been revealed! I'm glad C&H was picked instead of this. "Limited to 50 copies" makes this the absolute rarest piece of Wattersonity in all the universe. Take my advice: Give up on finding it. 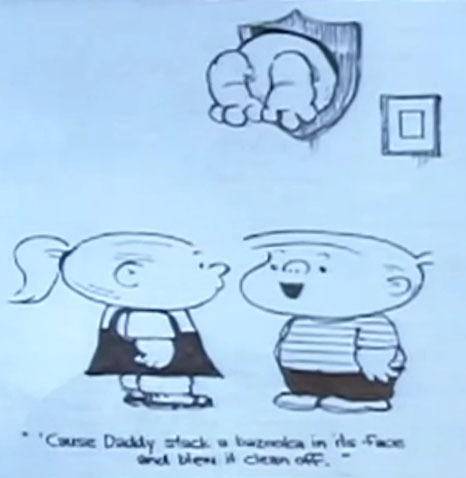 The washing machine strip has never appeared in any book, not even the Complete Collection. 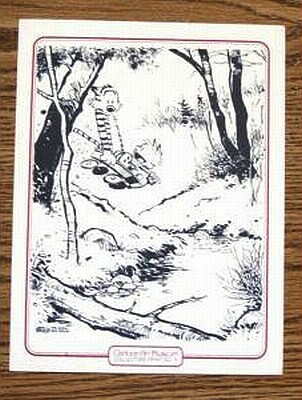 Promotional posters were printed for bookstores to use to advertise whenever a new Calvin book was out. In America, they were merely bigger versions of the cover art for the books, but in Britain they used new art from Bill. 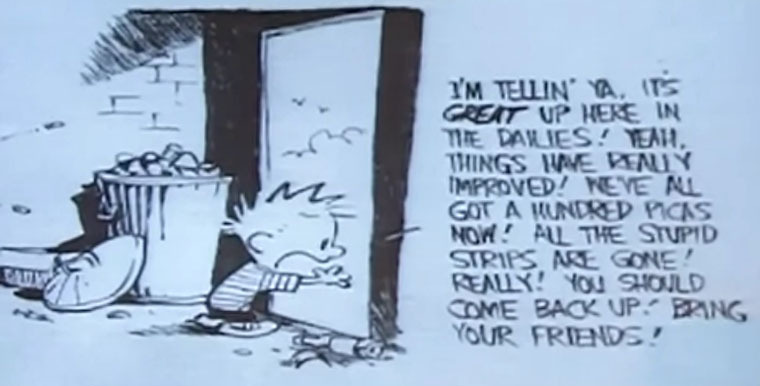 I'm going to guess that this was colored by someone else, due to Calvin's blue shirt. No one knows what this means. The prevailing theory is that it's a gift drawing, but to whom? The identity of "Buzzy Gran" is still awaiting discovery. Some people have written in to tell me "Buzzy Gran" worked for Cricket Magazine, but no one's been able to provide any deeper details than that. 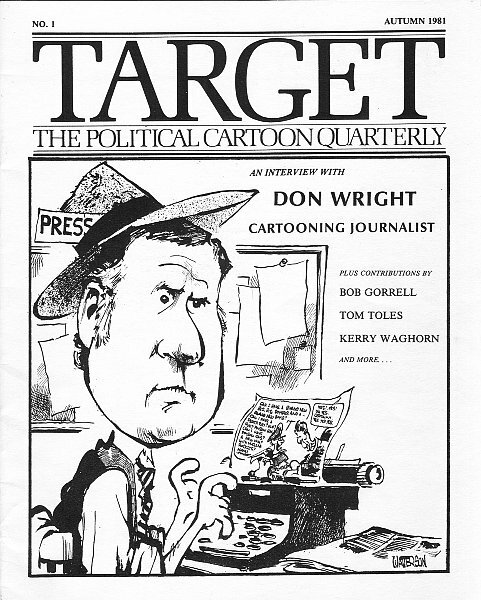 Bill's first print interview was conducted by the Cleveland Plain Dealer in March of 1986, and he drew this cartoon to garnish it. This was drawn for Scandanavian editions of the Calvin books. And this one was from another newspaper interview; this one being for the L.A. Times. 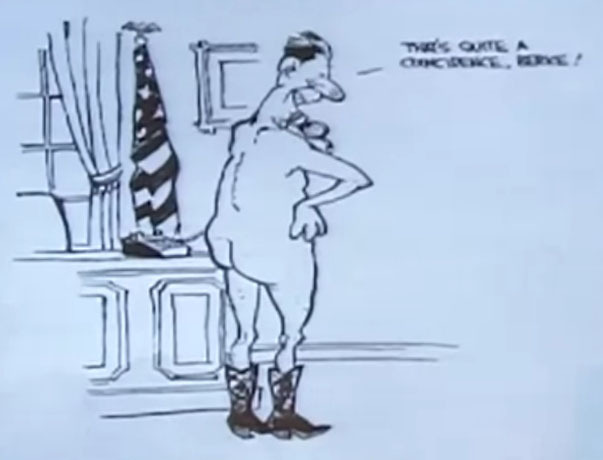 The Cleveland paper interviewed Bill again one year later, and he drew this one for them. 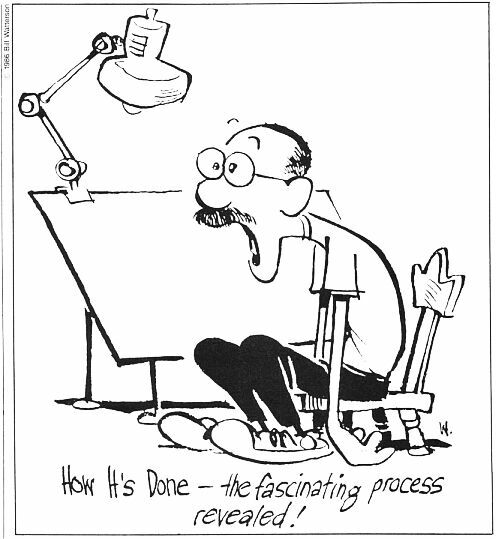 This self-portrait was also in the promo packets Universal used to sell the strip to new papers. 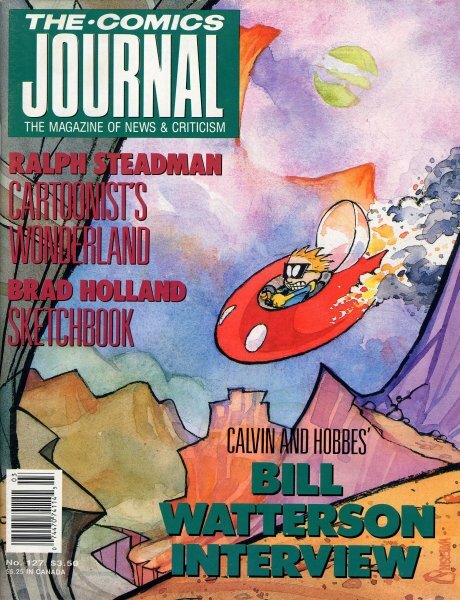 This was one of the illustrations used for a 1987 Watterson interview in a magazine with the unfortunate title of "Honk." 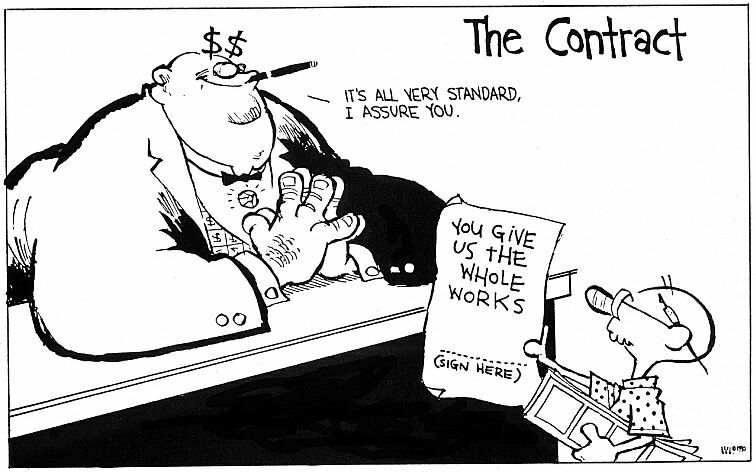 Speaking as another cartoonist, this drawing is more true than most people will ever be let known. This is one of the only legitimate licensed products that was ever made out of the strip. 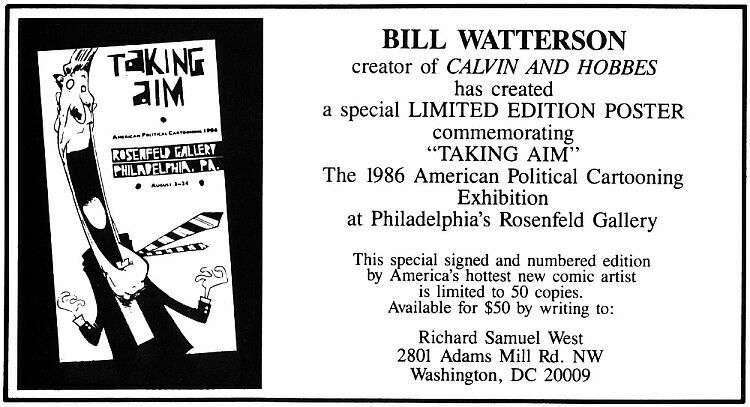 It was published in 1987, when Universal didn't beg Bill for merchandising approval often enough for him to care yet. 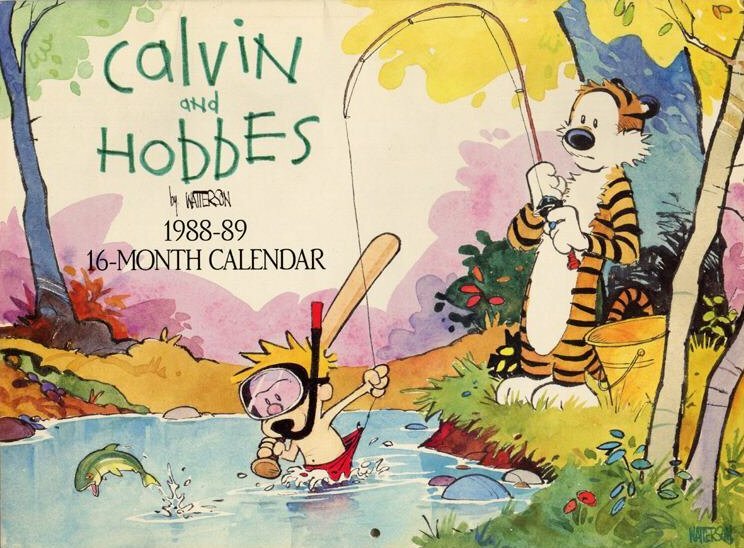 Same thing here--but no more calendars after '89. This one's also from the "Honk" interview. This drawing was ripped for a successful eBay scam. 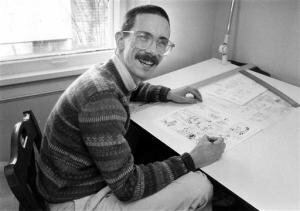 Around this time Watterson also gave the commencement speech to the class of 1990 at Kenyon College in Gambier, Ohio. The speech was mostly about his younger years and went into greater detail than his essay in the Complete Collection did. We'll unravel every detail of your life eventually, Bill. MWAAHAHA. 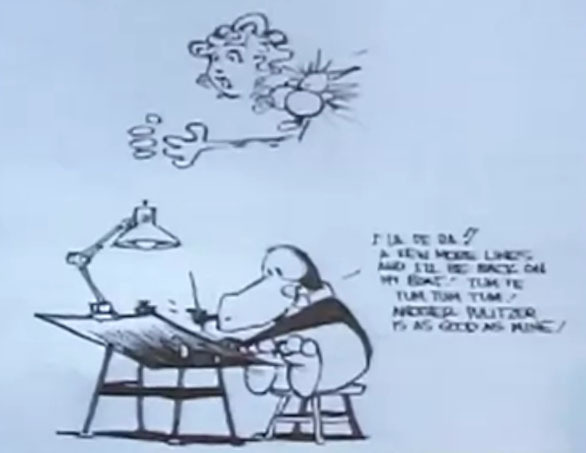 Watterson exchanged letters with Berke Breathed several times over the course of his career, and these letters were usually garnished with a Watterson-toon jabbing at Berke. 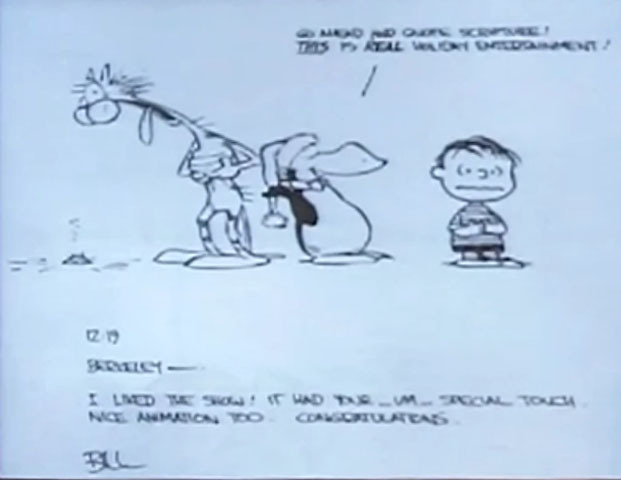 Until recently these cartoons were held privately by Breathed and only vague descriptions of them were gleaned from interviews with him....but finally, Breathed showed them all at a 2010 Comic-Con. 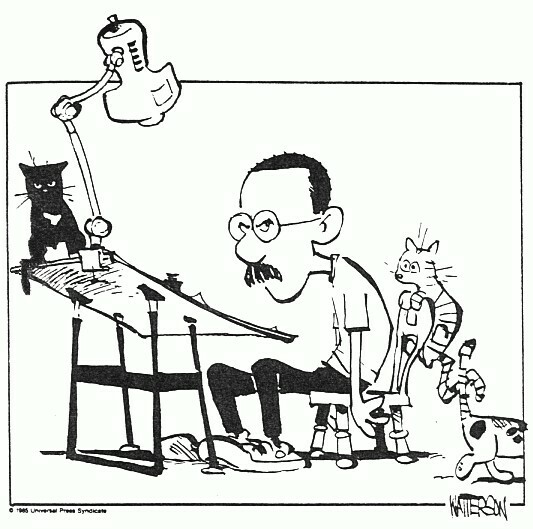 This piece of original art was a Watterson-signed and numbered lithograph given to newspapers that carried the strip when he took his first extended break in 1991. Only 1,000 were made, and the value of this is only trumped by that political book. Drawn right before the first sabbatical. 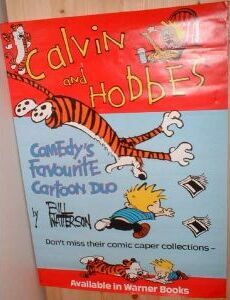 In 1990 the "Cartoon Museum of Art" released a Calvin and Hobbes poster. Like everything else on the page, if you've got it, you're rich. A LEGAL Calvin T-shirt? 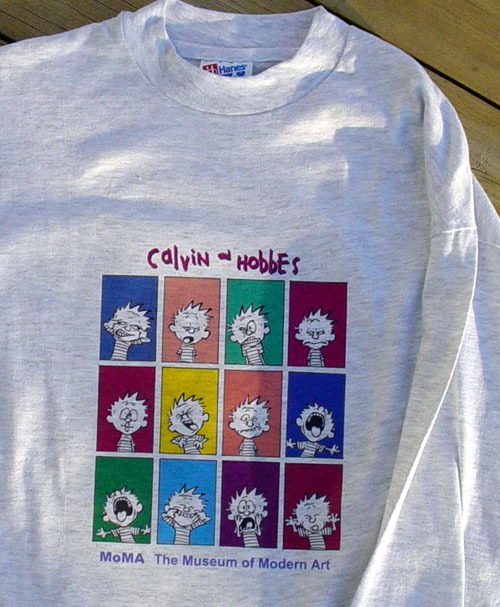 Yes indeed, this is the only licensed and approved Calvin shirt to exist. It was available only for a traveling exhibit on the art of comics. 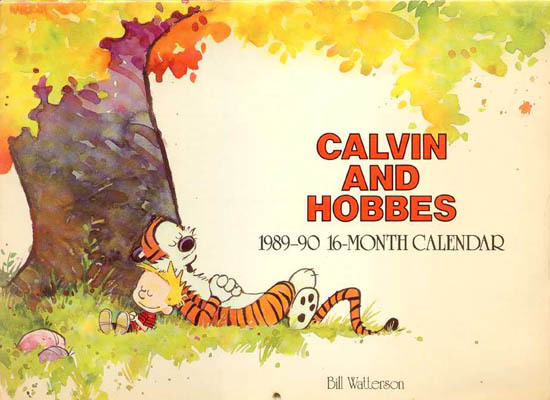 Finally, the only other official piece of licensing besides the calendars and shirt is "Teaching with Calvin and Hobbes," containing reprints of strips. 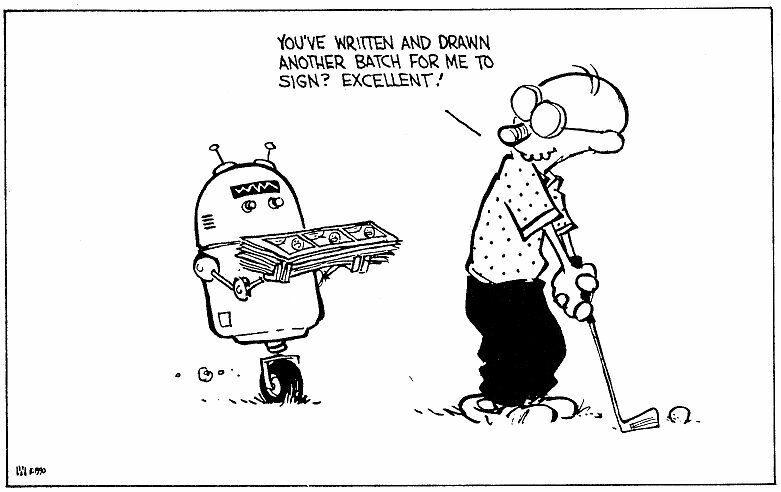 This comes from 1993 and Watterson just barely allowed it, after he got a letter from one of the authors describing how she used Calvin to teach to children with special needs. Universal put a legal vise on the print run, restricting sales to classrooms ONLY and producing only 2,500 copies. There is no new art in this book, but it was worth mentioning. 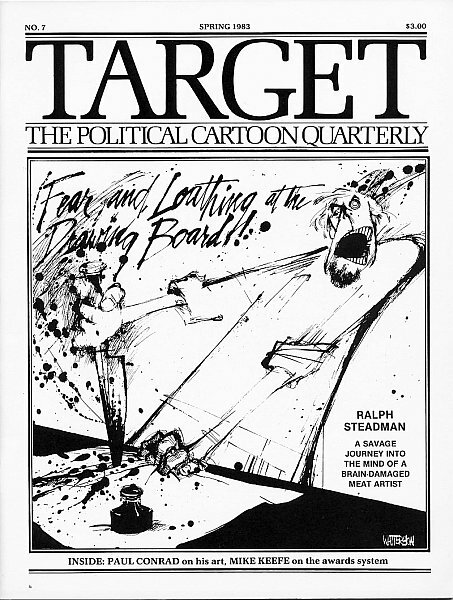 READ A REVIEW WATTERSON WROTE FOR "TARGET" IN 1984...the subject? 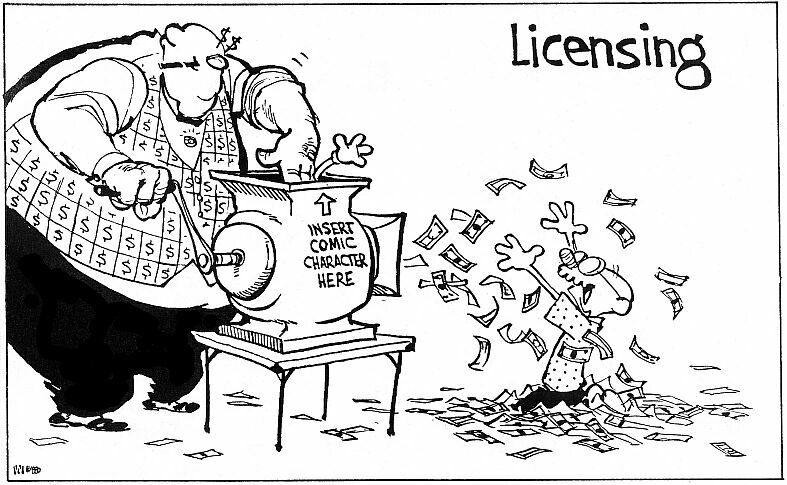 A BLOOM COUNTY BOOK! GENIUS COLLIDES!